Seeing the gravesite of Moses Rose, tucked away in Logansport, Lousiana, was truly fascinating. The legend of Moses Rose is full of intrigue, mystery, and rushes to judgment. Often called the Coward of the Alamo, to know his story is to know this title could well be both unfitting and unfair. It is he who tells the story of William Travis drawing the line in the sand at The Alamo for anyone who wanted to cross and thereby declare their intentions to enter battle… to fight a fight which pretty much promised the fate of death to all who took him up on his challenge. Rose did not cross the sand and because of that… And he lived to tell about it. He simply wanted to live… That was his admitted reason for not staying and fighting to his certain death. The true story of Lt. Louis “Moses” Rose remains a bit of a mystery. Different accounts tell different things, and which are tales and which are the truth have yet to be completely sorted. 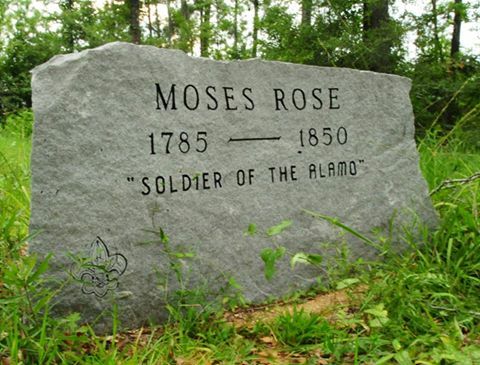 Rose got the nickname, “Moses”, supposedly because of his age when fighting at the Alamo (he was one of the oldest warriors there, at 50). While some accounts refer to Rose as a coward who fled the Alamo when the going got tough, others say he simply chose not to die what he determined to be a losing cause. There are even stories that Rose, who some say was a Frenchman, was an officer in Napoleon’s army. Whatever the case, it does seem he had lived a pretty much heroic life before the Alamo. 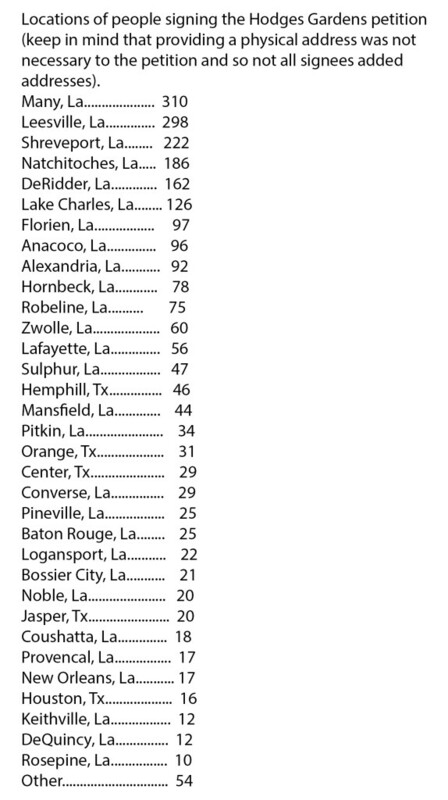 By 1827, he had settled in Nacogdoches, Texas. When the Texas Revolution began, he dedicated himself to the cause. 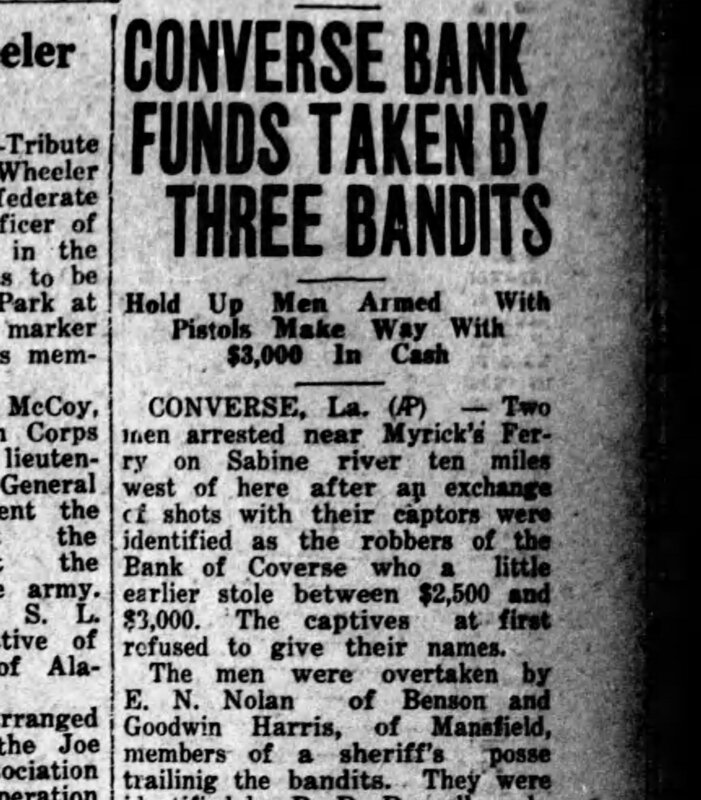 He sold or mortgaged all his possessions to fight in the Fredonian Rebellion and the Battle of Nacogdoches. He fought in the siege of Bexar and he followed his friend Jim Bowie to the Alamo. 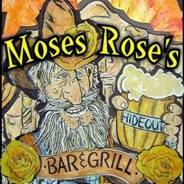 After quietly escaping the nightmarish situation in San Antonio, Moses Rose lived out his last years in East Texas and along the Sabine River. Such an interesting character. Rose’s reputation as a coward remained with him for the rest of his lifetime, and continues up to the present day. To those who accept the popular account, it matters little what Rose’s motives were; more important is the fact that he left, by choice. According to legend, when asked many years later why he did not cross the line and remain, he replied simply, “By God, I wasn’t going to die!” This alleged statement did not help his reputation, especially in Texas. During the period just before the 2003 invasion of Iraq by the U.S., the Rose legend gained new currency when France opposed the invasion. Anti-French sentiment in the United States increased and Rose’s legend was often invoked as an historical example of ostensibly French cowardice in the face of war, despite the unverified status of the popular account. In March 1836, the Alamo was surrounded by the Mexican Army, which raised a “no quarter” flag, promising death to all defenders. Travis, the Texan commander, drew a line in the sand with his sword. He asked the defenders to cross over it, and thereby pledge to fight (and presumably die) in the Alamo. 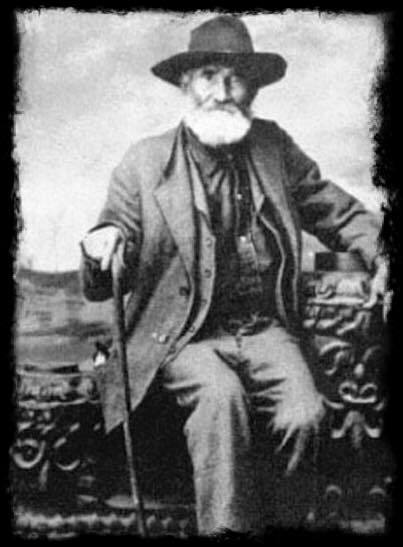 Rose is the only one who did not cross, but instead fled the Alamo the night of March 5, evading Mexican forces, and made his way to Grimes County, Texas where he found rest and shelter at the home of William P. Zuber. Rose made no attempt at hiding the true story of his journey, attributing his decision to a love for his family (including his children) and desire to fight another day rather than face a slaughter like those he had seen in previous failed battles. 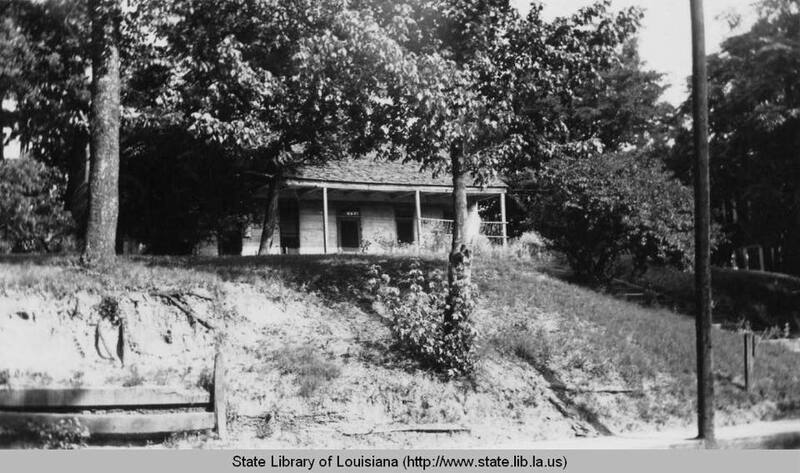 But Rose did not fight another day, and instead merely faded away from the revolution, later settling in Logansport, Louisiana. Some historians have said that the story of the line in the sand was first told by Rose himself. 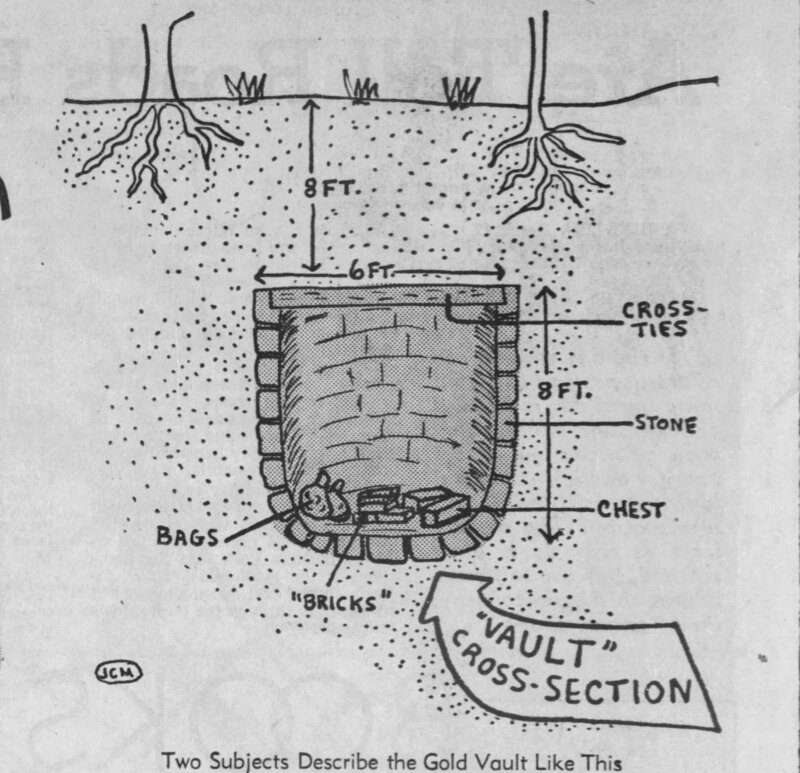 Whether there ever was an actual line drawn in the sand is disputed, but the evidence does suggest that all Alamo defenders were at one point given a choice to stay or to go. Rose is reported to have stated “I came to America to live, not to die.” Col. Travis gave Rose the opportunity to leave, and so he left. The info on the website continues, “He very likely crossed into Louisiana on the Logan’s Ferry, where he was befriended by Aaron Ferguson, a farmer who lived north of Logansport (then Logan’s Ferry) about six and one-half miles from town, on Castor Creek. Rose spent the remaining years of his life as an invalid on the Ferguson Farm. Rose died in 1850 and was then buried in the Ferguson Cemetery. I found Rose’s gravesite in remote DeSoto Parish. When I saw remote, I mean remote, as in it took us quite a while to find it, and it was pretty close to Panola County, I think. There is little fanfare marking his site, what you see is what is there, though he did get a nice new granite marker somewhat recently. 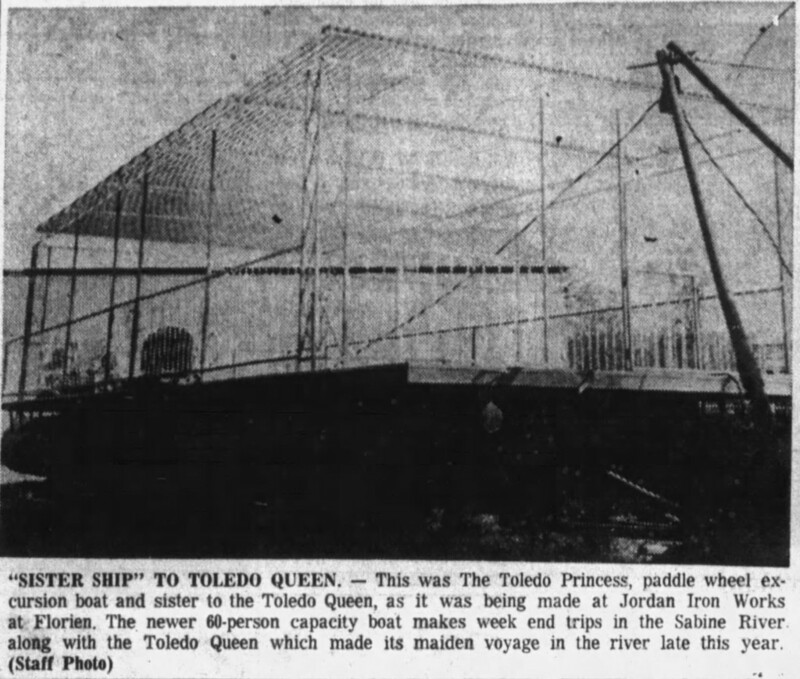 The following text is part of an article published in The Longview News-Journal on Jan. 1, 1967, and gives some details on two excursion boats that some All Things Sabine readers had asked about: The Toledo Queen and the Toledo Princess. Both were operated by Cliff Ammons, who became known as “the father of Toledo Bend” as it was he who introduced legislation as a State Representative to create Toledo Bend, and he was one of the main individuals behind the creation of the lake. Most knew Ammons operated the boats, but this article provides some interesting on who was behind making the boats, which was a Florien entrepreneur and enterprising, talented jack of many trades, Johnnie Jordan of Florien. As a young man, Jordan’s son, Rodney, helped his father build houseboats and today runs the business as Jordan Marine, still building some of the finest houseboats you can find anywhere around. C. R. (Cliff) Ammon s of Many is a man of numerous endeavors. Not only is he president of the Many Chamber of Commerce this year and vocational agriculture teacher in Many High School, but also he deals in real estate, devotes many hours to promoting development on Lake Toledo, and takes time out to build camp cabins in his Sportsman’s Paradise Subdivision. Rut the one enterprise of Ammons’ which has perhaps fascinated and captivated the largest numbers of people all up and down the Louisiana and Texas sides of the Sabine River and Toledo Bend Reservoir is his proof that the river is navigable. 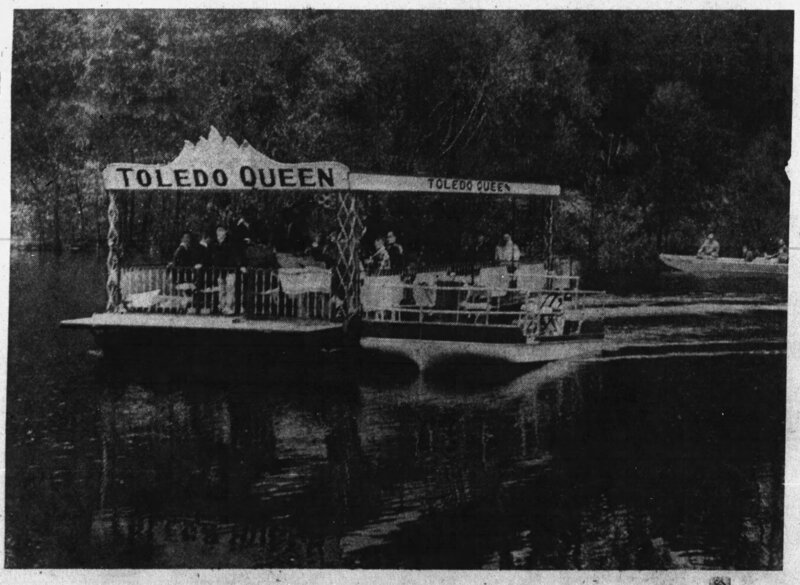 Ammons owns two riverboats, the Toledo Queen and a “sister” ship, the Toledo Princess. t h e latter a paddle wheeler. 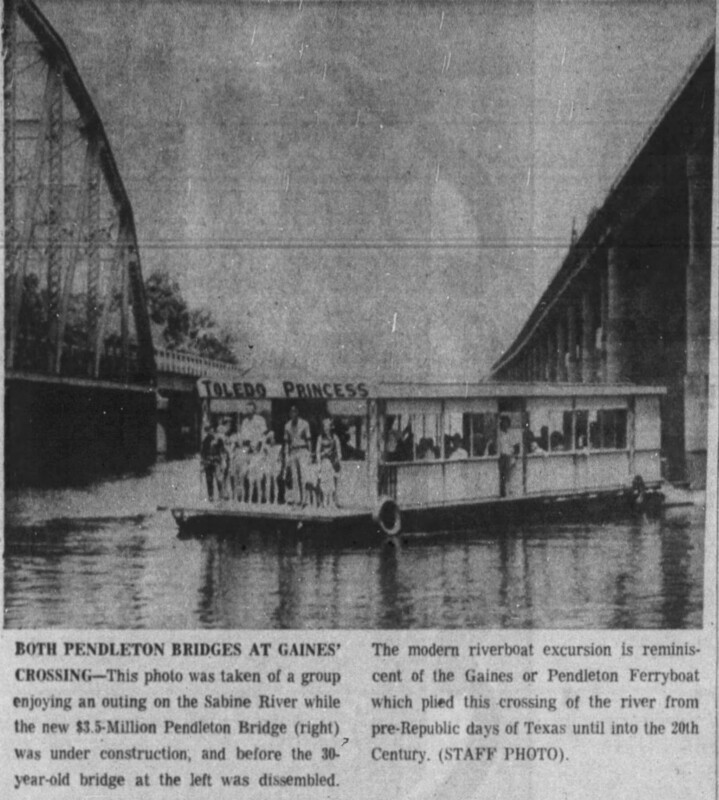 Both now are plying the Sabine River waters and making 10 – mile excursion trips, showing guests aboard some sights in the river, not seen since steamboats plied the winding waterway just after the turn of the century. 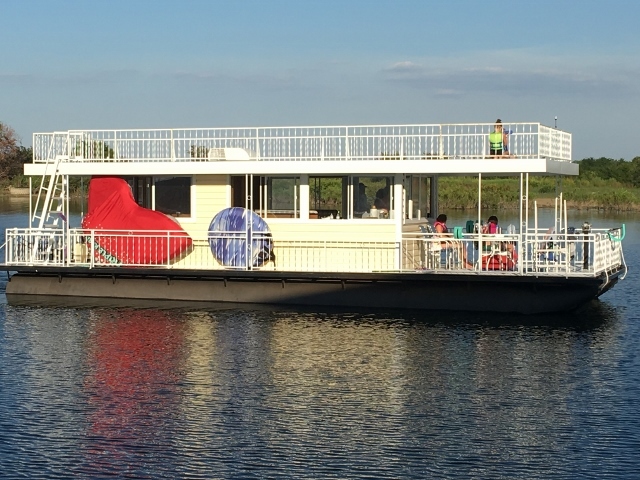 A steary stream of passengers can be found at Pendleton Bridge, on weekends and holidays when the weather is good, to take the cruises. Up to 60 people can board each of the two vessels. Oddly enough, both the Toledo Queen and the Toledo Princess were built in the area in which they were launched. 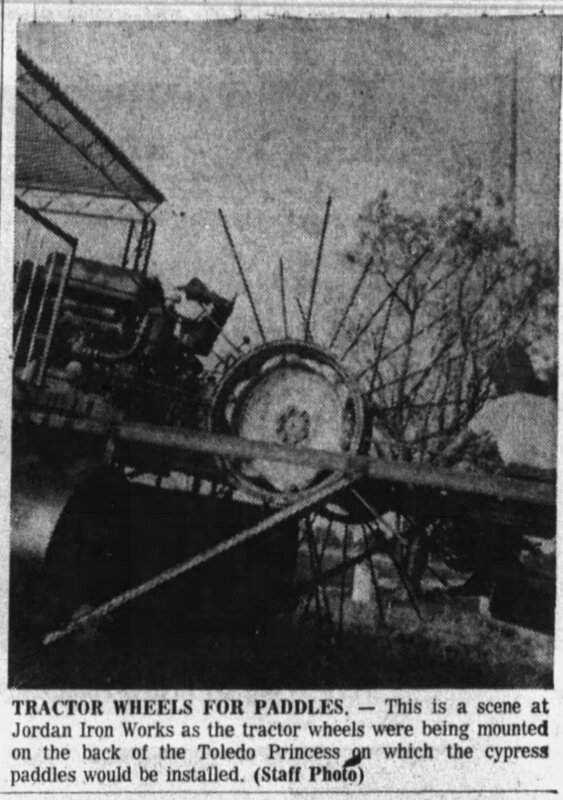 They are the construction of Johnnie L. Jordan, owner and manager of Jordan Iron Works Inc., near Florien, La., a few miles from Many. Jordan got into the boat-building business when he made a steel pontoon cylinder for a custom trip up in Shreveport several years back. 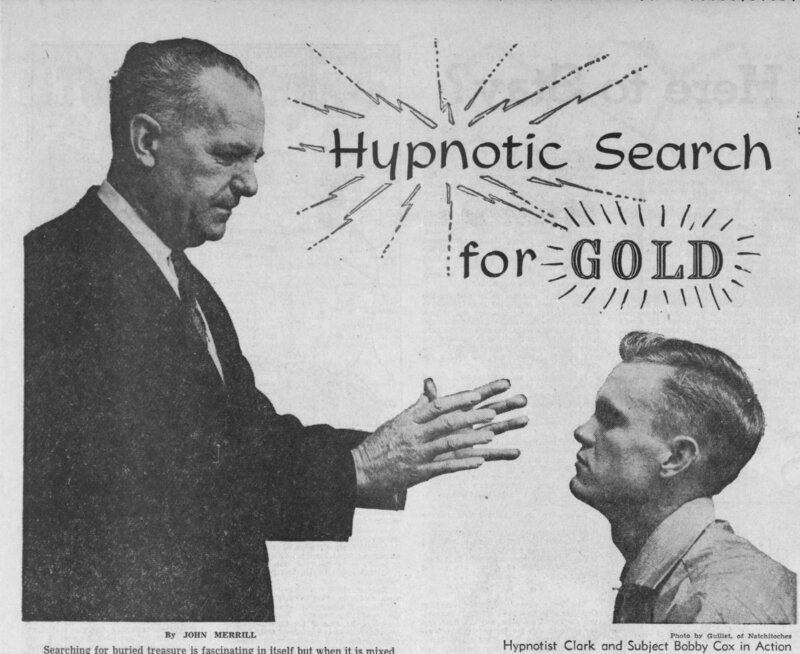 In fact, his firm was originally established as an ornamental iron-works outfit solely, but more arid more his business is boat-building, and he moved headquarters from Shreveport to Florien to be nearer Toledo Bend. 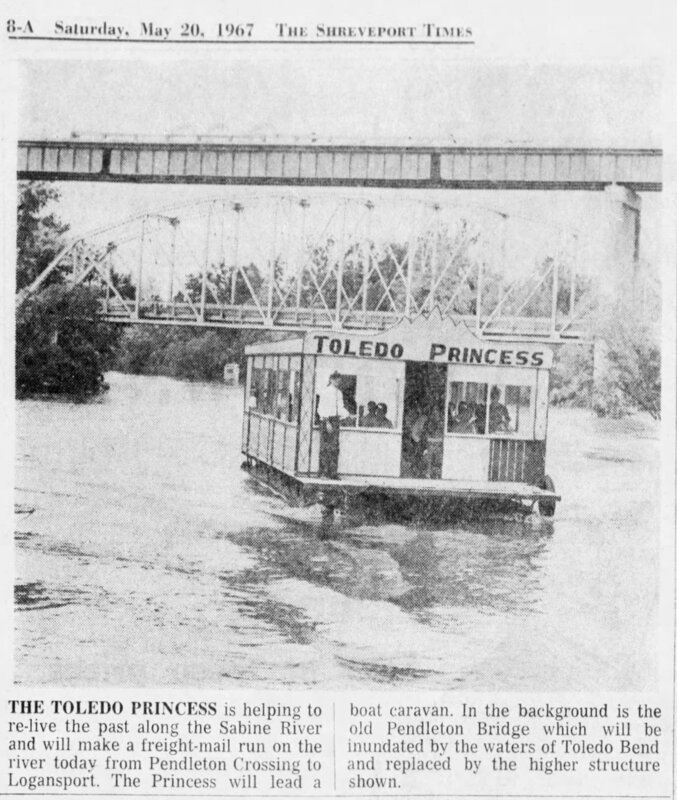 It was Ammons’ idea to make the Toledo Princess a paddle wheeler on the style of the old time water-wheel riverboat. He had tractor wheels and chassis hauled out to Jordan and the two men put their heads together and came up with the answer to “how” it could be done. Jordan mounted the tractor on specially-constructed framework at the back of the riverboat, inserted steel spokes to support the wooden paddles made of cypress, and eventually the Princess was launched. Ammons’ friend Jordan also builds boats other than excursion vessels. 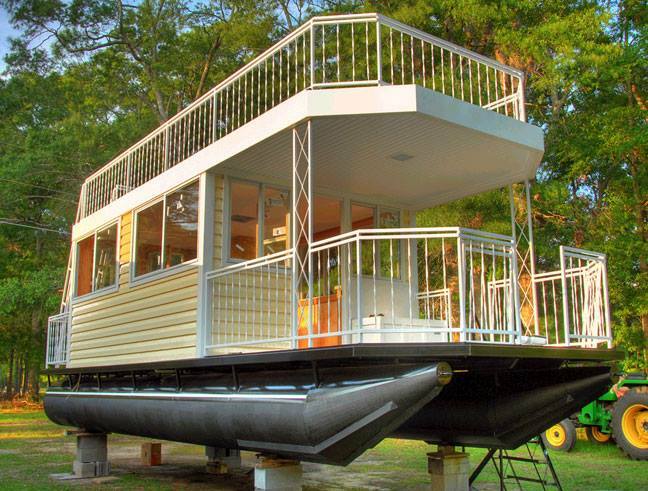 In fact, he has built them with full cabins, controls, sleeping quarters (with a backrest pillow for bed included) and in prices ranging from $7,500 to $12,000. They tan be found plying waters around Jackson, Miss., Dearborn Lake near Farmerville, La., the Arkansas River, and Lake 0′ The Pines in Texas. 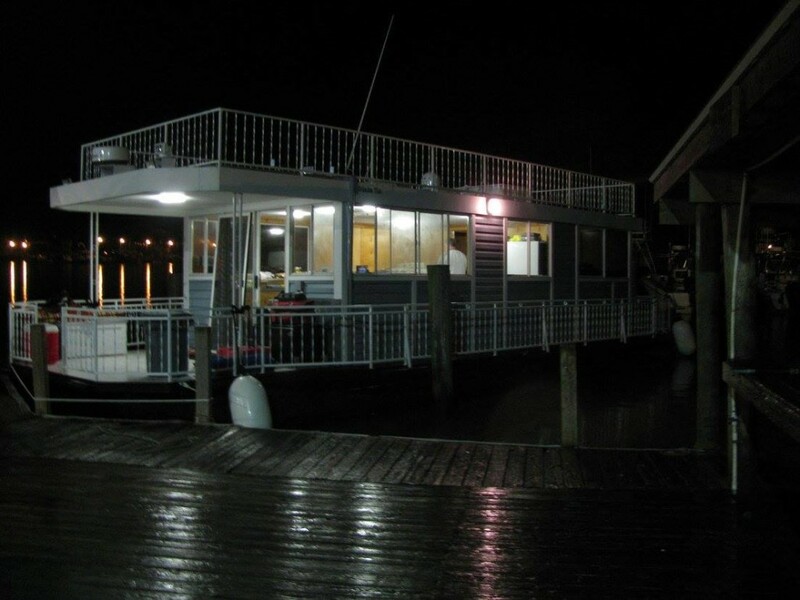 Jordan Marine, owned and operated by Rodney Jordan, continues to build fine houseboats today.